Ok! If you've never read Doctor Cat, you're missing out on a hilarious and adorable comic by Sarah Sobole about a cat who is also a doctor. I was reading through the archives and I got an idea for a strip staring the good doctor, so I figured I'd draw it up as a piece of fan art. Doctor Cat is really fun to draw and so are blood and guts. It's not often I get to draw something cute AND gory. 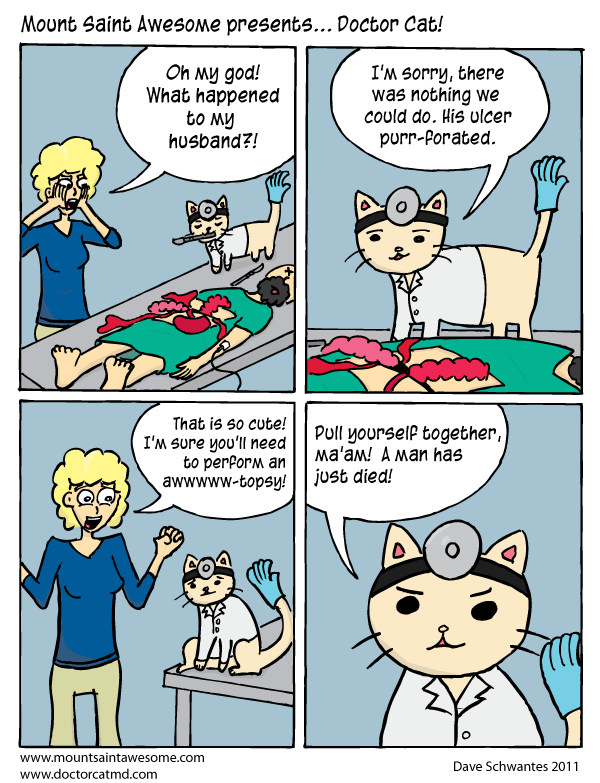 I hope this does the real comic justice and please go read the REAL Doctor Cat! I hope everybody has a great T-Gives (that's how I assume cool people would say "Thanksgiving"). Enjoy your birdflesh!